It appears, however, that the court had thrown out the earlier 3 year ban on infomercials imposed on Trudeau. Instead, the court upheld a requirement that Kevin Trudeau post a $2 million bond “before he participates in any ‘infomercial for any book, newsletter, or other informational publication, about the benefits, performance, or efficacy of any product, program or service referenced in any such [publication]. '” In other words, Trudeau will have to supply the FTC with a $2 million bond before he airs an infomercial, and if he once again engages in deceptive practices the FTC will then keep the bond. It appears that Kevin’s magic genie and GIN/Illuminati buddies are letting him down on this one. Maybe this case will make it all the way to the Supreme Court. That would be tough for Kevin Trudeau…because Ruth Bader Ginsburg and Sonia Sotomayor look nothing like Denise and Sara! So according to Trudeau’s very own “Your Wish Is Your Command” gobbledegook, he wished to lose his appeal. Congratulations, Kevin! You got exactly what you wanted (and deserved). Too bad good ole Kevin forgot about the flip-side to the whole “laws of attraction” mumbo-jumbo: Careful what you wish for, because you just might get it. This must have just been handed down because I’ve seen a few times now a “Breaking News” informercial for an updated version of Kevin’s book “Free Money….”. They don’t have him on the infomercial itself save for clips of him from previous infomercials but it’s a pretty amusing 20/20-style show. Lots of testimonials from “Regular People” on it. 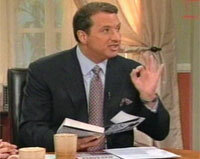 Kevin Trudeau is a piece of dirt. Stop buying his crap. If you want to give your money away, then give it to the many charities that support are veterans. Kevin is only looking out for his own interests, and he does not care about you or your loved ones. His infomercials, books, and other material are very misleading at best, and downright lies, if not pure cow manure. 14 special reports including The Cancer Cure, The Natural Depression Cure, The Natural Insomnia Cure, The Natural Attention Deficit Disorder Cure, The Natural Erectile Dysfunction Cure, The Natural Allergy Cure, The Natural Arthritis Cure, The Herpes Cure, The High Blood Pressure Cure, The Natural Diabetes Cure, The Acid Reflux Cure, The Natural Cholesterol Cure, The Natural Asthma Cure and The Natural Male Enhancement Cure. Clarification: I was only kidding about the helping him part, so do not point your artillery at me. Now that I think of it, I have not seen that lying verminous weasel on TV lately. It is good to know that the courts have cut off his TV privileges. There are probably a few million gypped customers of his that would like to cut off various components of his anatomy. I listened to his CD’s a friend lent me. Not as hokey pokey as you might think, there is something there, as he is not making up all of it, he is simply passing on the info. He is smart, and educated, I will give him that, and anybody with balls big enough to take on big brother, who seems to only want a bigger bite than it’s fair share is respectable in my books. Big Pharma is so deeply veined into the media and big brother that I would side with the one guy who is fighting them both…that being said, he’s not getting a penny from me, but I will send him mental frequencies to keep on fighting…good for him. I think advertising is advertising, if he had the money to fork out for 32000 airing of his infomercials, then good for him, Tom Vu did it, so have hundreds of others. KT is definitively smarter and more articulate than anybody I have read criticizing him. I have studied Kevin Trudaeu, and Gin. that He is Fined Hundreds of millions of dollars, and is imprisoned for many years. selling garbage to rip people off. man ,and improving his own life. false, devoid of moral value ,but full of profit motive. Nobody should have to pay money or be part of a group to get anything that is truly free. Free anything is an oxymoron. This includes Masonry.